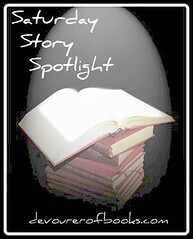 Welcome to Saturday Story Spotlight, my feature where I discuss books my husband and I are reading with our children. These are books that they, we, or all of us particularly enjoy. I doubt I am alone in this, but when I was young I simply adored Ludwig Bemelmans’s Madeleine. In Frankenstein, Rick Walton and Nathan Hale – writing under the pseudonym Ludworst Bemonster – parodies the beloved childhood classic to monstrous effect. Their main character, as you might expect, is a little Frankenstein, although instead of the littlest of them, he is the ugliest one. The first portion of Frankenstein is particularly clever. Bemonster has a good ear for the rhyme and meter of the original Madeleine and the story is cute. 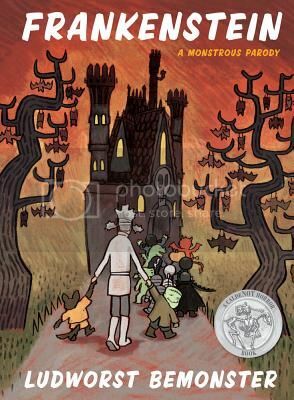 The monsters’s teacher Miss Devel wakes one night, certain that something is quite wrong and finds that Frankenstein has, quite literally, lost his head. Frankenstein has some really great ‘spooky’ vocabulary. Things are grotesque and gory, full of shrieks and howls and groans, the monsters torment Miss Devel. The plot loses a bit of steam at the end, though, particularly after what should be the end of the book. There are two more pages of illustration that are so anti-climatic that they nearly ruin the entire book. Of course, that is all from an adult’s point of view. Daniel, who is now three years old and has never read Madeleine, thoroughly enjoys Frankenstein. He has pronounced it his “favorite,” seemingly due to the good cadence and rhyme, as well as the cutely spooky illustrations. Smiles are contagious, whether from a family member, or made out of macaroni and cheese. Ruth Kaiser makes a point of seeing – and photographing – smiley faces everywhere and they are highlighted in The Smiley Book of Colors. 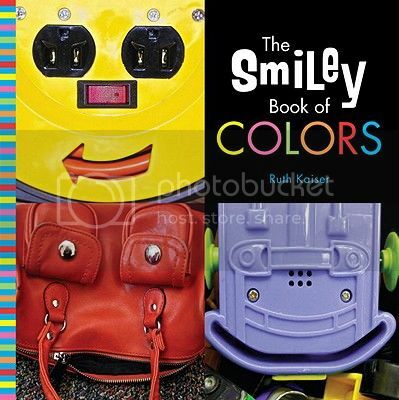 Sorted by color and accompanied by brief rhyming text on each page, there are some 30 smileys faces found in every day items in The Smiley Book of Colors in addition to those found on the end papers. 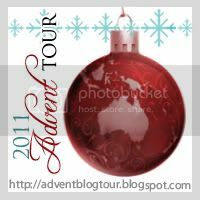 I must admit, I was skeptical about The Smiley Book of Colors, most of all whether Daniel would appreciate it. Surely 2 and 1/2 is too young, I thought, to comprehend something as abstract as faces in inanimate objects. Luckily I took a chance with it anyway, because Daniel absolutely adores The Smiley Book of Colors. He seemed to be not entirely sure what he was looking at when he first flipped through the book, but once we showed him one smile, he could see them in each and every picture and found each of them absolutely delightful. He can also tell us what most of the objects actually are as well. In addition, the book is enhanced for him by the color groupings; not only does he want to go through and find all the faces, he goes through and announces the color on each page as well. The Smiley Book of Colors will both delight children, and teach them to look for the creative and unexpected in the world all around them. There is a lot to do during the holidays: buying presents, making cookies, putting up decorations, and doing a million little things. This is all a lot to handle for a little llama who is getting dragged to and fro with his mama llama. Llama Llama is more than a bit frazzled and overwhelmed by the whole thing. Finally, his little self is unable to handle it any more and he throws a temper tantrum. Luckily, Llama Llama has a smart mama who, though she lost site of his tolerance a bit while trying to get ready for the holidays, does realize that the point of all of this is to create an atmosphere for togetherness, and that she needs to not let preparations get in the way of time with her little llama. She explains all this to Llama Llama, and takes time out of her busyness to sit still and cuddle with him, which helps to stop the llama drama. This is our second Llama Llama book, and both Daniel and I are big fans. The illustrations are adorable, and Llama Llama is the typical extremely cute and occasionally frustrating toddler. He has very toddler reactions, which means that Daniel can relate, understand, and empathize (“Llama Llama is SAD!”). His mama is both firm and loving, a great role model for fallible parents who might similarly forget their child’s limits during holiday preparations. 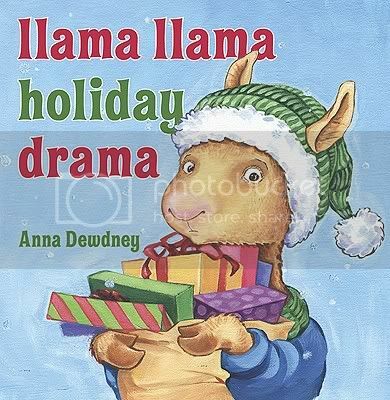 My only real criticism of Llama Llama Holiday Drama is that it didn’t seem to scan quite as well as Llama Llama Red Pajama. Still, though, we will absolutely be buying and reading more of Dewdney’s Llama Llama books. When Jack finishes doing chores for his neighbor Mrs. M, she gives him nothing more than a handful of beans. He’s disappointed, yes, but he decides to plant them as she suggested. 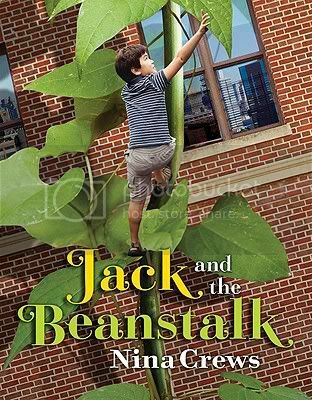 The next morning, he finds a large beanstalk outside his window, and decides to climb it. You likely know the rest of the story, but Nina Crews has updated and condensed it somewhat from the original. Although there is a golden harp in the pictures, the only treasure of the giant’s explicitly mentioned, and the only one Jack steals, is the hen that lays the golden eggs. When the giant catches Jack in his kingdom in the clouds, he puts him straight to work cleaning dishes, instead of threatening to eat him. The biggest divergence, however, is what happens when Jack chops down the beanstalk: the giant and his wife fall from the sky, but instead of being killed, they appear from under the beanstalk as normal-sized people, and it turns out that the giant is actually Mrs. M’s brother. My reaction every time Daniel and I finish Jack and the Beanstalk is to be angry at Mrs. M. She gave Jack the beans in order that he might manage to save her brother. At an earlier point in the book, the giant’s wife tells him to be careful with this boy, as he doesn’t know his own strength. This implies to me that Mrs. M has sent other boys up and bad things have happened to them. It is quite selfish and slightly evil of her to be sending young boys into the sky to save her brother at their own peril without even telling them what they will be doing. This isn’t really addressed in Jack and the Beanstalk, though, there is simply a happy reunion between brother and sister. Before the part where the characters make me angry, though, I love this update of Jack and the Beanstalk. The illustrations are live action photographs, which helps it stand out from all of the other picture books we read, most of which are either pictures of individual things, not whole scenes, or they are not photographs at all. The editing is very well done, so that giant beanstalks and people 5 times normal size look as if they are actually all together, making it all look very realistic. I also appreciated that the people pictured were multi-cultural. This is a fun story made special with its live action photograph illustrations. Plus, it keeps my two-year old engaged, which is the most important thing. Tumford isn’t really terrible, exactly; in reality, he is a very nice cat. The problem is that, like many cats, he has a tendency to make messes and, when he does, he has a very strong aversion to the words, “I’m sorry.” Day after day he gets into scrapes around the house, and instead of owning up to what he has done, he hides all over the place from his very pleasant human parents. Tumford’s parents are understandably very frustrated with the situation, but instead of getting angry, they decide to try a different technique. They will give him a treat, take him to the big fair that is in town, if only he will promise to apologize for anything he does that goes wrong. As you might guess, Tumford isn’t able to behave himself completely at the fair. His first reaction when things go oh-so-wrong is still to hide, but as he is hiding, Tumford thinks about his parents, and realizes what he really wants to do is to make them proud. Tumford the Terrible is a very sweet book. Tillman found a very good balance with Tumford’s actions. He is never deliberately malicious, just naturally curious in the way that cats and small children tend to be and, as is often the case with cats and small children, his curiosity has a tendency to end messily. Hiding from one’s mistakes is an unfortunate reaction that people of all ages have, so showing children that it is better to own up to one’s mistakes is a very good message. Even better, Tillman manages to keep the message from becoming a heavy-handed MESSAGE. Part of what keeps Tumford the Terrible from becoming too preachy is Tillman’s jaunty verse, but most of the credit belongs to the absolutely gorgeous illustrations. You must find a copy in a bookstore and flip through it, my personal favorite is when Tumford and his family are marching off to the fair. The picture is a full spread, with Tumford marching assertively in front of his family wearing yellow boots. It is absolutely gorgeous. 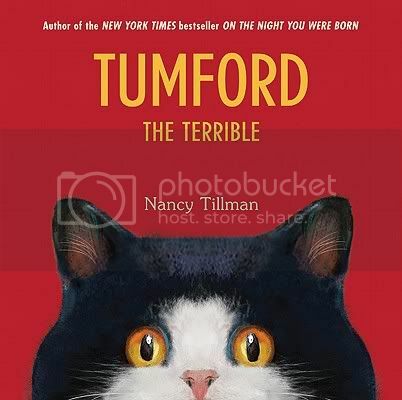 So clearly I like Tumford the Terrible, but what about my toddler? Some of the pages have a bit more text than he likes to sit still for, but they are well-balanced with much shorter pages to keep the story moving for younger readers, which keeps him actually seated and engaged for the entire book. An even better measure of enjoyment, though, is the fact that the “cat book” has become a frequent request.